The One (Or Two) That Didn’t Get Away! At least once each summer during our time at the beach Tad organizes a deep-sea fishing expedition. He charters a boat and a captain (think the S.S. Minnow with a more competent staff) and off everyone goes…always at some ungodly hour of the morning. Unlike the Minnow, they are back several hours later with the fruits of their mission. And, almost always, we have fish that the gang caught for dinner that night. Well, this year we were a bit more relaxed about our visit to the beach and organized NOTHING before heading out East. So, when on a Wednesday Harrison said he wanted to fish on Thursday, we had to scramble. Tad started working the phones and the internet. He found a fabulous boat and captain- but the only option was an afternoon trip…traditionally less desirable for deep-sea fishing. Still, the boys and my niece Charlotte were thrilled and off everyone went for a very civilized Noon launch. The day was cloudy and slightly rainy. Not the best for being out on a boat….or, was it? 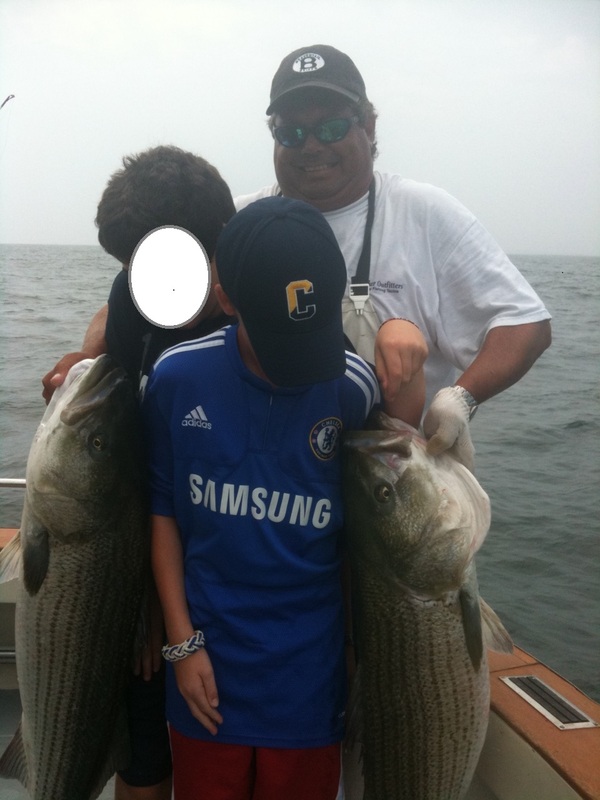 The gang returned, and boy, were they ever successful-to the tune of over 100 pounds of Striped Bass! Harrison’s friend Sam caught a 44 pounder, Harrison a 39 pounder, and Charlotte- caught more fish than anyone! Wowsa! Talk about fish for a century! Luckily, Tad gave the bulk of the catch to the Captain and the First Mate. But, my team still walked through the door with twenty pounds or more of seriously fresh fish! So, immediately, a Dinner Dilemma was before me. What to do with this fish? Given that it was 4 pm when the troops returned and dinner for the night was already planned, I stuck the mass- and I mean mass, of fish in the fridge and pondered what to do with it as we all ate steak. The big question with Striped Bass of this size was how to tenderize it and add some flavor so that the kids would try it and the adults would love it. I knew I needed to marinate it- the question was in what? I settled on an olive oil and lemon marinade- but with a bit of mint for a vibrant change. I marinated the fish all day, grilled it and reserved some of the marinade to drizzle on the fish right before serving. The results were stellar. While the kids still shied away from the fish- preferring meat- they did try it. Meanwhile, the adults were thrilled with the “Catch of the Day!” It doesn’t get fresher or better than that! Mix all ingredients in a bowl. Reserve ½ c for drizzling over the fish once it is cooked. Marinate the fish in the rest of the marinade for at least 4-6 hours- and up to 24. Preheat the grill to medium hot. Grill the fish until tender- about 5 minutes a side. If the filet is very thick, it could be longer. If very thin, it will be shorter. Serve immediately with the reserved marinade drizzled over fish. This entry was written by Caroline, posted on August 11, 2010 at 9:25 am, filed under Uncategorized. Bookmark the permalink. Follow any comments here with the RSS feed for this post. Post a comment or leave a trackback: Trackback URL.